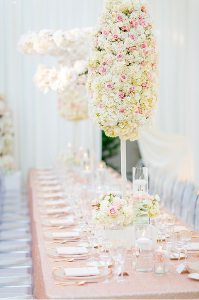 Erin and Mike's beautiful wedding flawlessly combined a soft pink and cream color palette with a very linear and clean design. This wedding, held at a private residence in La Crescenta, California is one we won't be forgetting any time soon! The ceremony featured one of our favorite canopy structures draped in a white ruffled chiffon fabric with ghost chair seating for the guests. The main focal point of this area, however, was the breathtaking floral masterpiece that began at the top of the structure and cascaded down the front sides. Here, we used hydrangea, spray roses, regular roses, and bay laurel. Underneath the canopy hung a beautiful chandelier. Behind Erin and Mike as they said, "I do" were glamorous strands of crystals that coordinated with the chandelier. Erin's gorgeous bouquet featured beautiful blooming peonies, garden roses, spray roses, and regular roses. The handle was wrapped in a cream satin ribbon with one of our favorite crystal embellishments! Mike's boutonnière was made up of two petite spray roses with one large rose and a sprig of dusty miller. We always have fun at SYED when we get the opportunity to create a custom monogram or cutout for our clients! Erin and Mike wanted an awesome pool treatment so we, using our trusty hot knife, cut out this monogram that coordinated with their stationary. Also, check out our awesome mum balls! One of my absolute favorite parts of Erin and Mike's special day was the linear and clean design that they chose to go with. The gold accented place seatings matched the champagne shimmer tablecloths perfectly! Our long and low centerpieces featured lush florals mixed with floating candles and lucite platforms. The use of lucite, acrylic, and glass cylinders perfectly matched the ghost chair seating- everything was so flawless! Another amazing part of this wedding was the custom creation of the tall floral structures. Each one hand-carved by our floral designers stood atop large platforms with petite coordinating florals at the base. Behind them stood our large floral rings that used the same florals with bursts of white phalaenopsis orchids. Everything about this reception was so sweet and romantic. The wonderful draping turned this backyard into a masterpiece and perfectly set the stage for our centerpieces! We loved how detail-oriented this entire event was. Star and her team at Sterling Engagements did an absolutely wonderful job coordinating this event! All of their stationary coordinated and the sweetheart table featured these darling gold "his and hers" silhouettes. This gorgeous draping still continues to blow me away! Isn't this a gorgeous shot from Ryan Phillips Photography?! Such beautiful work and the chandeliers continued the same look from the ceremony. We repurposed the ceremony site and it quickly became the cutest cake table area ever! 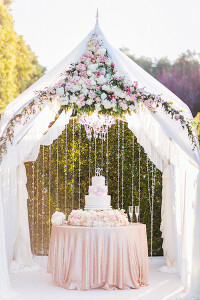 The lush pink florals matched the darling cake perfectly and the crystals used on the canopy matched the cake topper! Erin and Mike deserved every part of this beautiful wedding and we are so thankful to have had the opportunity to work with them!